BRANSON, Mo. – Grace’s volleyball saw its season end on Friday at NCCAA Nationals in a one-set playoff. The Lady Lancers wrapped up pool play on Friday morning with a five-set victory over Trinity International. 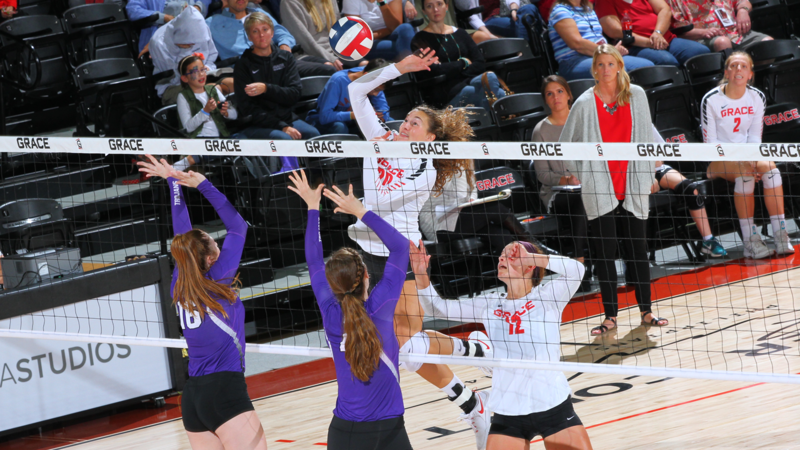 That win placed Grace tied for the lead in pool play with Ozarks and Southwestern Assemblies of God (SAGU). Based on tiebreakers, Ozarks advanced to the semifinals as the group winner. Grace and SAGU then faced off in a one-set playoff for the final semifinal position. SAGU won the playoff 25-20, sending SAGU to the semifinals and ending the Lady Lancers’ season. The noon match was the final pool play contest of the tournament. Grace pulled away late in the opening set to win 25-16. Trinity was held to just seven kills in that opening game. The Trojans’ offense responded in the second set. TIU had 21 kills in the set, holding off Grace 25-22 to even the match. The third set was even more hotly contested. Grace led by three late in the set, but TIU rallied to claim a 23-22 advantage. Grace managed to hold off a set point at 24-23, 25-24 and 26-25, but the Trojans secured the win 28-26 to go up 2-1. Needing to win to avoid elimination, Grace came up big in the final two sets. The Lady Lancers jumped ahead 11-3 to start the fourth set and coasted to a 10-point win. The Trojans started the fifth set sharply by going ahead 5-1. But Grace quickly assumed control over the next few plays. The Lady Lancers won eight of the next nine points to lead 8-6 at the midway mark. Caylie Teel had two kills during that span, and Kelsee Zuidema had a kill and an ace. Grace extended its cushion with a pair of kills by Marta Bleed, and Grace secured the comeback victory with a 3-2 win. The tiebreaker loss to SAGU officially wrapped up the careers of graduating seniors Teel, Zuidema, Bleed and Kelsey Smith. Teel concluded her career with a massive stat line of 27 kills and 29 digs, and Zuidema added 15 kills, 9 digs, 3 aces and 4 block assists. Bleed produced eight kills and two block assists, and Hanna Leach had eight kills on a .571 percentage to go along with three block assists. Alexa Hill had a double-double of 57 assists and 16 digs, and Makaela Lochmueller had 4 kills, 5 digs, 2 solo blocks and 1 block assist.